Hero-entrepreneur dreams up a great idea, finds a sidekick or two to help it come alive, clashes with and defeats the entrenched incumbent, and rides to glory as the credits roll. The story of Sonos might seem like that, from a distance. Its four founders - John MacFarlane, Tom Cullen, Trung Mai, and Craig Shelburne - conjured a daring vision based on technology that didn't exist at the time. Fuelled with the insight earned from success in the first phase of Internet-based business-building, they chose as their next mission a new way to bring music to every home - wirelessly, in multiple rooms, from PCs and the Internet, with awesome sound. They hired an amazing team who built amazing products from scratch, and music devotees all over the world found a new brand to fall in love with. But what about a closer look? What are the frustrations and failures they experienced on the journey? Are there larger lessons to be learned? The story of what Sonos did and is doing might be familiar to many. With first-ever details, what follows is the story of how. John MacFarlane moved to Santa Barbara in 1990 to get his PhD from University of California-Santa Barbara. Instead, he saw the promise of the Internet and built Software.com along with Craig, Tom and Trung. After Software.com merged with Phone.com in 2000 to create Openwave, they moved on to figure out together what to do next. Whatever was going to be next, they knew they wanted to stay together, and stay in Santa Barbara, due to the roots they and their families had begun to establish there. It was, perhaps, the beginning of a habit of unorthodox choices to add both a degree of difficulty and a fresh perspective to the work. First, the proliferation of standards meant the Internet is a programmable platform. Second, the collapse of costs for the brains and nervous systems of computers – integrated circuits, central processing units, and other technologies – meant these components were fast becoming commodities. Third, the four founders could see what the builders were buying, and thus they could see digitisation just getting started all around them, with nearly unlimited possibilities for more. Finally, as Tom would say, they realised that for networking, “what would be large scale would become small scale.” Wide-area networks would create markets and bring reliable capability to local-area networks. John’s first pitch to his three partners was actually around aviation. The notion was an offering to enable local-area networks (or LANs) for aeroplanes, with passenger services provided within them. That idea did not generate the enthusiasm John had anticipated, so it was back to the drawing board. But that drawing board soon became filled with inspiration from the four friends’ mutual love of music, and mutual frustration with the pain of storing hundreds of CDs, dealing with the tangled spaghetti of stereo and speaker wires, and enduring the expense of custom home wiring for multi-room listening experiences. This became the opportunity to apply their unique talents, resources, and insights. The vision was simple: Help music lovers play any song anywhere in their homes. The one problem, in 2002: Almost none of the necessary technology existed to achieve that. The next great start-up involving music and technology would take root between the global hubs of both more than 90 miles from Los Angeles, and more than 250 miles from Silicon Valley. With a vision that was pure imagination. In 2002, great music in the home meant wires hidden behind bookshelves and furniture, connecting to speakers the size of bongo drums; audio jacks plugged into the right holes on the backs of receivers and players; physical media primarily in the forms of compact discs and tapes - and if you wanted a multi-room experience, an afternoon (or weekend) drilling through walls to snake wires from a central receiver to speakers throughout your home. Whiste the original Napster had risen and fallen as a means to find music online to play on the personal computer, digital music was still new, and the idea of streaming music directly from the Internet was far-fetched. Pandora, iTunes, Spotify, and the rest of today’s leaders in music streaming services did not exist, nor did the iPhone. The top Internet service provider in 2002 was still America Online via dial-up, and fewer than 16 million U.S. households had high-speed broadband. Undaunted, the founders went to work scoping out their vision and seeking uniquely great talent to join them. Their first step was to translate what they imagined onto paper. This very basic sketch, though updated and enhanced in multiple directions, remains part of the foundation of Sonos products today. The second step was recruiting singular talent—which took about as long. Schulert felt the same affections for Boston as the founders had for Santa Barbara. Sonos opened its second office in Cambridge – with a promise to never view one office as more of a headquarters than the other. It’s worth asking how a no-name, long-shot company like Sonos could attract such world-class talent. Along with their earlier success with Software.com, the founders had a few big advantages: a reputation for technical expertise, an extensive network of great executives, engineers and designers, an eye for talent – and a bold vision that inspired the daring. This intrepid band went to work, holing up together in a large open room above the Santa Barbara restaurant El Paseo, with the afternoon smell of Mexican tortillas deep frying to make crisps. The beginnings were not auspicious. Whilst the challenge of inventing a multi-room wireless home audio system might have been enough, the team also collectively had made bright-line decisions around ease of use – meaning set-up would have to be fast and intuitive for anyone, it would have to integrate well with any technology or service, and it would have to deliver superior sound in any home environment. The sum of all those noble user-oriented decisions is that technical problems threatened to overwhelm the small Sonos band of engineers and designers right from the start. Cross-technology integration meant choosing Linux as the technology platform, but no drivers existed at the time for audio, for controllers’ remote buttons or scroll wheels, or for the networking that was needed. The Sonos team had to build them. Great multi-room music meant inventing a method to get audio instantly and wirelessly to multiple speakers without listeners noticing any gaps, ever. The team faced a choice: allow each speaker to fetch music independently, or have a master speaker fetch and distribute. The question was, distributed intelligence or central intelligence? We chose distributed, not because it was easier – it wasn’t! – but because it was the right architecture for the experience we wanted to deliver. The team chose the latter as the best experience for the user, but that choice had its own domino effect: how (in 2003) do you manage buffering to guard against network interruption (which would stop music mid-song), and what happens if the user removes the master speaker from the group? 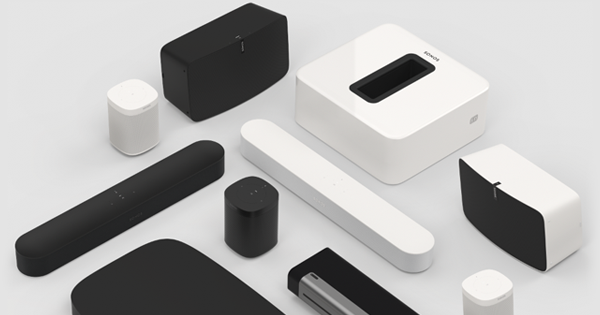 In what ultimately became one of Sonos’ key patented technologies, the team customised a process called delegation expressly for multi-room, wireless music, to enable transition for any and all speakers without any drop-offs. Along with a novel approach to time-stamping the digital bits of music playing via audio packets, they made it virtually impossible for a Sonos system to play music out of synch – and easy for users to link and unlink rooms, and to fling music to and from any room in the home. And soon, one problem was solved. But only on PCs hooked up to each other as nodes in a network, because Sonos still had to craft its own hardware – and the PCs were wired together, because the team was struggling with the wireless part. MacFarlane was encouraging, but also unyielding: the system had to work over Wi-Fi. We had to reinvent how devices communicate with each other. We could not, and did not, limit ourselves to what existed at the time. The team recognised mesh networking as the key. By 2003, it was a concept that had seen use in highly-mobile environments, like battlefields, but never applied in the home or to the stringent demands of music experience. To develop and implement, Sonos had two choices: an easier engineering solution at the expense of its ideal user experience, or making it simple and great for users and excruciatingly difficult for its engineers. The team dug in to add mesh networking capability along with the rest of its advances, and by September 2003, it was time to show John and the rest of the leadership team a prototype. As with most prototypes, some parts worked perfectly, some showed promise, and some parts flunked. The mesh network capability showed up as especially incapable. Sonos turned to Nick Millington, who had already established himself among his colleagues as an elite developer with his inventions in audio synch. It didn’t matter, either to him or to the rest of the team, that he brought exactly zero experience in networking to the assignment. With the help of faculty at UC-Santa Barbara, a consultant, and a vendor, Nick taught himself in six weeks about mesh networks whilst also building one from scratch for Sonos – on hardware Sonos was also designing from scratch. Tom Cullen gives Bill Gates one of the first public demos of Sonos’ ZP100 and CR100 at CES in January 2005. In the meantime, Rob Lambourne and Mieko Kusano were leading the effort to write product specs, develop wireframes, test with user groups towards creating the right user experience presented in beautifully-designed hardware. With the basic framework of the system built by early 2004, filled with new and untested technologies, the next phase focused on the scourge of software engineers: bugs. Despite all the ingenuity at hand, the prototypes couldn’t communicate wirelessly to each other from even ten feet apart. And particularly with embedded systems, at the time developer tools and debuggers did not exist. Keep in mind that the notion of mesh networking existed, but not in any audio products. Almost no one anywhere was working on embedded systems with Wi-Fi. There were no good Linux drivers with Wi-Fi. We were building our own hardware that we hadn’t fully tested. Nick’s the best developer I’ve ever worked with, by far. So Nick and John took a road trip, the prototypes stowed in a cardboard box in the back seat of John’s car, to Silicon Valley to see John’s friend and hardware supplier, whose advice boiled down to one word: antennas. This led to another round of grinding through arcane technical details around transmission standards (only 802.11-b/g at the time), antenna selection and placement, network device drivers and spanning tree protocols, and the many ways human living spaces can cause signal interference. This was a time that none of the principals describes with any romanticism or even nostalgia: it was simply a lot of work, day after day, with incremental progress instead of eureka moments or big breakthroughs. Developers know that the most frustrating bugs are the so-called “irreproducible” bugs. Many of them emerged from testing at Sonos employee homes in and around Santa Barbara – including one especially frustrating bug, only reproducible at one person’s house, that required a packet sniffer to identify and fix. Sonos’ first product, the ZP100, earned praise for simple set-up, ease-of-use, great sound. By Summer 2004, Sonos had tackled the bugs, prototypes were beginning to function with the necessary reliability, and the team had started sneak-peeking the system to others in the industry. This confirmed what they had been beginning to recognise: the hard work to that point had paid off in the form of something genuinely new. I was responsible for capturing and protecting all the early intellectual property, and I firmly believed we were making the right design choices. But at the same time, every once in a while we’d raise our heads up from our work, realise we were all alone, and wonder ‘how come no one else is doing it’? The industry reaction along the way was electric, featuring a demo at the 2004 D: All Things Digital conference that put Sonos on the map. As the late Steve Jobs was unveiling Apple’s Airport Express on the main stage as its solution for home audio – one that required users to return to their computers to control the music - Sonos was in one of the hallways demonstrating more advanced functionality and full user control in the palm of the hand. Breakthrough music experiences often debut with certain signature songs. MTV, for example, famously launched with “Video Killed the Radio Star,” by The Buggles. How about Sonos? The first song played for the public on Sonos’ first product, the ZP100, was The Beastie Boys’ “No Sleep ‘Til Brooklyn,” at full volume, produced by longtime Sonos supporter/adviser Rick Rubin. Sonos engineers could affirm the “no sleep” part because of all the work they’d put in leading up to the ZP100’s launch. But getting the experience just right for customers required a more practical approach to selecting songs for testing, dictated by the early days of scrolling through long alphabetical-order lists of songs and bands. So the most-played song by Sonos engineers for testing was “3AM” by Matchbox 20, for no other reason than it was at the top of a list. The most-played band: 10,000 Maniacs. The early industry encouragement didn’t mean they were free from new setbacks. Sonos had committed to a Fall 2004 ship schedule for its first products, and co-founder Trung Mai had spent most of 2004 hopscotching across Asia with foam models of the hardware to find the right contract manufacturer. Once secured, Jonathan Lang jumped in and took over responsibility for overseeing the factory lines – another career first for him. As the product lines were rolling, he noticed what he described as a “small issue” with the controllers, specifically with a glue agent that wasn’t working right. “Why aren't we going to USD 500 million [in sales] in a day?” Then, the recession hit the company hard. "The world stopped. After all, nobody needs a Sonos,” says Cullen. At the time, the company was working on a larger wireless speaker, but didn’t have the capital to follow through. Some staffers, including Cullen, borrowed money from friends and resorted to paying employees out-of-pocket [Trung Mai, in particular, did this more than once, according to Cullen]. Sonos determinedly stayed the course, making key bets on next-generation systems and technologies with the conviction that consumers would catch up. The company relied on John’s instinct to anticipate trends and take advantage of them, even if it risked being too early. Its second- and third-generation systems were efforts towards streaming direct to its players, taking the PC entirely out of the equation. They started in 2006, with Rhapsody as its first music service. It was a big turning point for the company, and it was not at all obvious at the time. Then in November 2009, Sonos released the PLAY:5, a truly smart, all-in-one speaker for USD 400, about a third of the inaugural price of Sonos’ original product, the ZP100 (which with speakers and controller, cost about USD 1,200 in 2005). Their hopes for sustained, strong sales growth were realised. This also marked a more decisive shift towards continual software upgrades for ongoing improvement in the products, an ever-more-exacting focus on sound quality, and closer relationships with recording artists and others in the creative community. Those relationships took Sonos to a new dimension as a company. Sonos recognised that making music sound great in the home means asking the makers how they want their music to sound. Sonos quickly learned that, as exacting as its engineers and designers might be, there are no more demanding critics than musicians. Sonos established early testing and feedback processes for its products with the creative community, involving producers, musicians, and composers. With Trueplay, launched in 2015, producer Rick Rubin headlined a team of advisers to bring the artists’ perspective into the product development process from its beginning. Part 4: By music lovers. For music lovers. Sonos as a brand and company built a sturdy foundation in those first years, when its culture first took shape – one that puts the experience first, is relentlessly progressive, and one where people treat their customers as they would want to be treated. It continues to attract world-class talent looking to be pioneers, who are willing to push themselves to break new ground, within a set of principles established in 2003. A by-product of these principles is, without hyperbole, a fanatical obsession about quality. This obsession showed itself specifically in Jonathan Lang’s decision, with Sonos leadership’s strong support, to scrap a large quantity of manufactured products and start over again because of a small bit of glue – and more generally in the long, drawn-out grind to get the first wave of products exactly right. User experience needs to be deep in the bones of a product, not on the skin. The right way to design is from the inside out. You don’t design a technical architecture and then make it look pretty. You start with the customer. Hone in on the key areas where you are trying to make a difference and make it special. Then it’s all hands on deck to re-invent. It shows in Mieko Kusano’s and Rob Lambourne’s conviction to build sharp design and ease-of-use from the beginning to every phase of product development, with strict attention to detail. Not many companies will go to the extreme of developing a new plastic resin, which Sonos did to help eliminate vibration and improve the versatility of its subwoofers and speakers. Sonos culture means extended deliberation and testing over the size, number, and placement of vent holes in the new PLAYBASE (there are 43,000 holes in the PLAYBASE, of different sizes, for anyone curious). An inseparable element of this exacting environment of creativity and precision is an unapologetic belief in protecting invention. One of Jonathan Lang’s first assignments at Sonos, irrespective of lack of experience in intellectual property, was capturing each new Sonos advance in order to protect it through patents. At Sonos, engineers and designers have maintained an enduring appreciation for IP rights as a basis for competition, industry partnership, and innovation. When looking to the future, people at Sonos are clear they are not about merely constructing marvels of technology. They are crafting richer music experiences within the home, which means joining forces across the universal divide between engineering and creative talent. They have witnessed the difference it brings to the experience for musicians and listeners at home. Artists feel satisfied that their work sounds as it should. Music lovers get the joy of experiencing music together at home. And in that way, the story concludes where it started. A group of people, in many rooms around the world, focused on a daring vision: any song, in any room, always sounding amazing. “Sonos Spins into Control,” Santa Barbara Independent, Matt Kettman, 27 August 2015. "Sonos builds beyond its bass," Fortune, JP Mangalindan, 25 June 2012. “How Sonos Built the Perfect Wireless Speaker,” Bloomberg, Ryan Bradley, 30 October 2014. “The Story Behind the Wireless Music System 10 Years in the Making,” Mashable, Amy-Mae Elliot, 8 December 2011. “How a Beatles producer is helping Sonos re-imagine the way we hear music,” Fast Company, John Paul Titlow, 29 September 2015. “The Infinite Music Collection,” Joel on Software blog, Joel Spolsky, 9 November 2006. "Gadget That 'Streams' Music Around House Is Terrific but Pricey," The Wall Street Journal, Walt Mossberg, 24 February 2005.